GEDAT Datentechnik GmbH has been distribution partner of important KVM producers for D/A/CH for 15 years now. 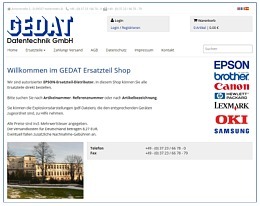 GEDAT Datentechnik GmbH is authorised distributor for EPSON spare parts, EPSON-Service-Center and distributor for EPSON products. IT-retailer may buy from GEDAT-eshop directly.